Born Roanoke Rapids, North Carolina, November 5, 1939; admitted to bar, 1965, North Carolina; 1969, U.S. District Court, Eastern District of North Carolina; 1976, U.S. Supreme Court. University of North Carolina (A.B., 1962; J.D., 1965). Delta Theta Phi. 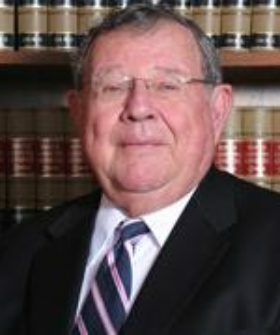 North Carolina State Bar; North Carolina State Bar Council (1993-2001); North Carolina Bar Association (Inductee, General Practice Hall of Fame, 1999); North Carolina Academy of Trial Lawyers. Columbia Rotary Club (Past President); Columbia Masonic Lodge. He served as Prosecutor for Tyrrell County Recorders Court, County Attorney for Tyrrell County (1968-2005), Attorney for Tyrrell County Board of Elections (1968-1995), and as President of the 2nd Judicial District Bar Association.